Looking for an exciting activity in Big Sur? Go for a bike ride! 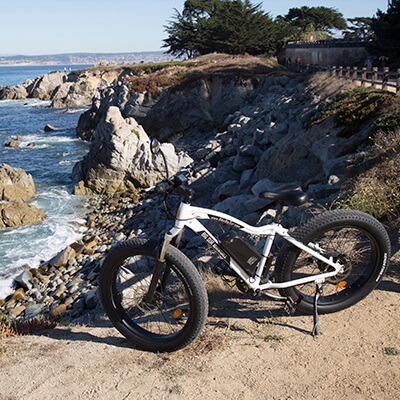 Our reasonably priced e-bike rentals allow you to explore Carmel, Monterey, and Pacific Grove at your own pace. 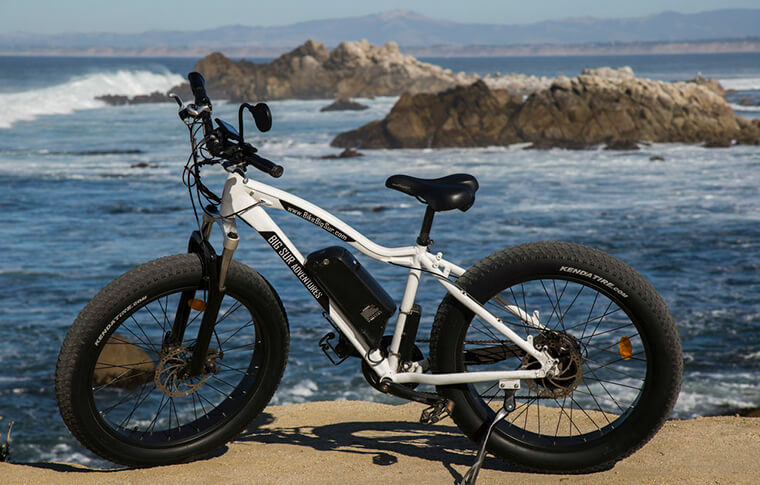 Each battery offers a range of 20 to 50 miles, and we rent extra batteries for those who want to go even further. 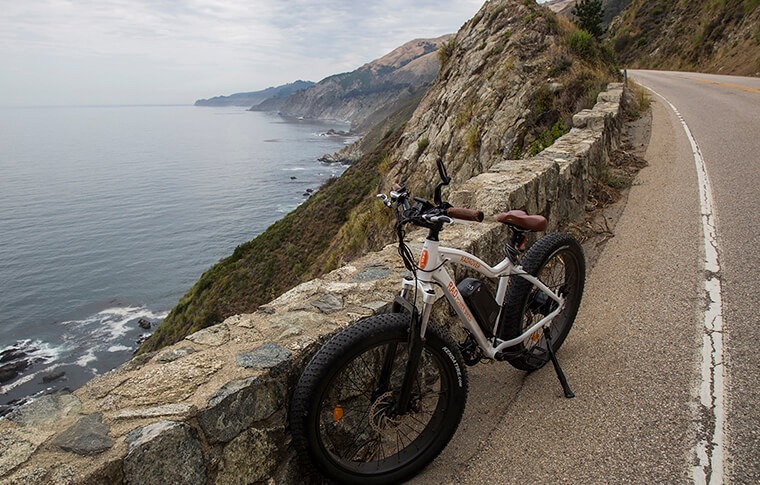 Whatever path you choose, you can’t go wrong with a rental from Big Sur Adventures! Long-term rentals are available for as little as $90 per month. Contact us for more information. With 26″ fat tires and a front suspension, the RadRover offers a very smooth ride. It boasts stability and safety at higher speeds and can also handle sand and snow. It’s our most popular model among riders taller than 5’4″. Riders 5’2″ and above can typically straddle the center bar, though they will not be able to reach the ground from the seat. We have some with racks and some without, so if you need a rack, please let us know. If you’re looking for a true comfort cruiser, the RadCity Step-Thru is your bike. Our brand new addition features a low-step frame design and swept-back handlebars. 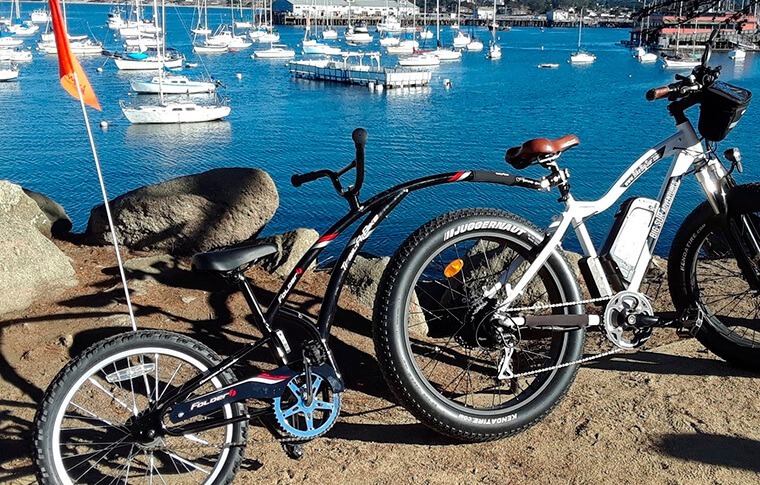 It’s still packed with a 750-watt motor and a 48V power system, however, giving you the benefits of the original RadCity in a more approachable package. The RadMini is the “sports car” of our fleet, surprising most riders with how quickly it takes off. It has the most torque and is capable of accelerating faster than any of our other bikes. 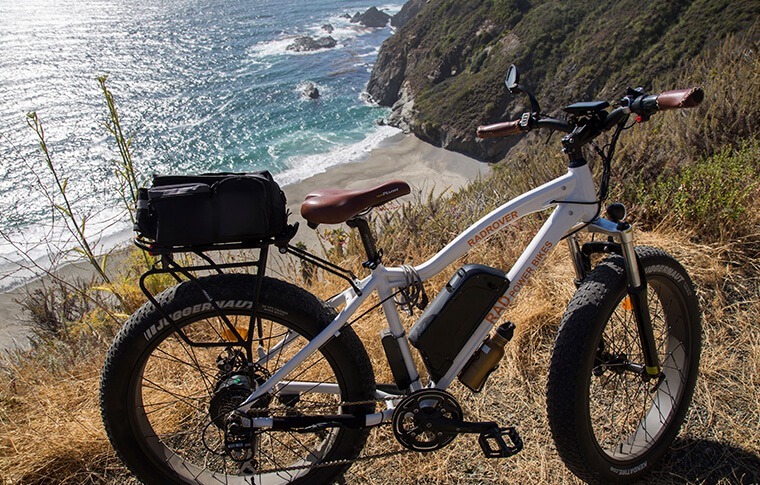 Despite its small size, the RadMini can conquer any type of terrain: it’s the best climber in the group, and its fat tires provide a smooth ride on the sand. As a foldable bike, the RadMini fits easily in the back of an SUV, making it the perfect option for those wishing to take an e-bike out of town. 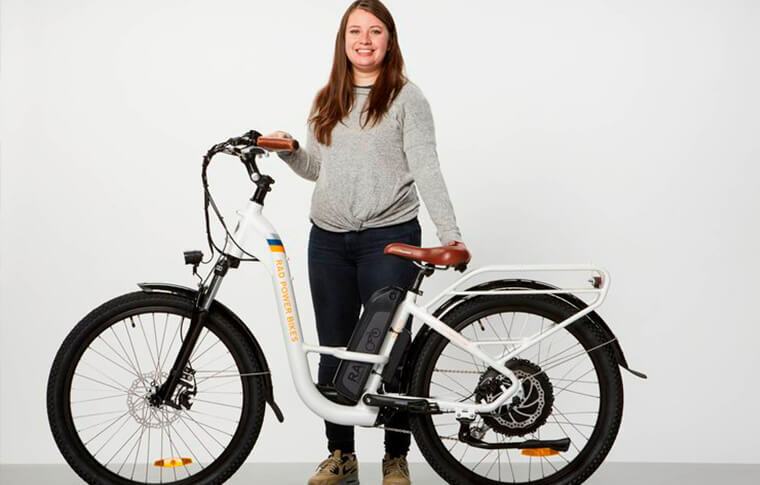 The RadWagon is a 21-speed electric bike. It takes off slower than the other bikes, but it is still strong. One or two riders (adults included) can ride on the back as long as they are old enough to hang on. The rear seat has a 120 lb maximum weight limit, while total rider weight must be less than 350 lb. 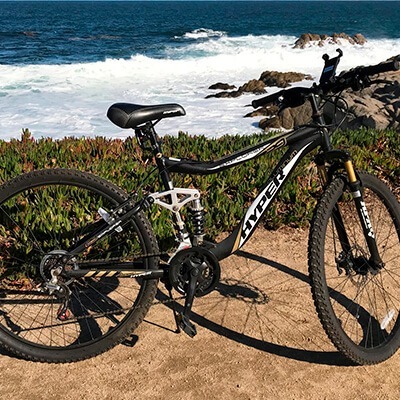 This bike is similar to the RadWagon listed above. It offers a toddler seat for children up to 48.5 lb, as well as room for a second child (or small adult) in front. Although this is not an electric bike, it can be towed behind the RadRover. It is designed for children aged 4 and older who weigh less than 85 lb. The Propella 2.0 is a 250-watt e-bike with pedal assist up to 15 mph (but no separate throttle). 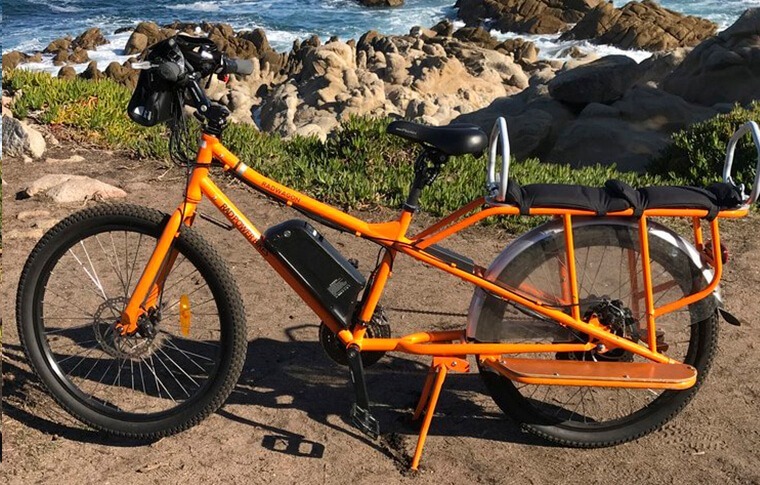 With its thin tires and 7-speed gearing, it’s a lightweight (35 lb) electric bike with the agility and feel of a traditional road bike. 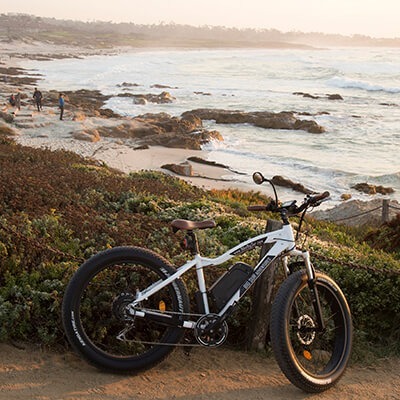 The Sondors Thin is a 350-watt, 36V e-bike. It weighs 55 lb and can go up to speeds of 20 mph. In addition, it offers single-speed gearing, 5-speed pedal assist, and a thumb throttle. Our most popular rentals are our Rad Power bikes, as they allow riders of all fitness levels to ride together at the same pace. 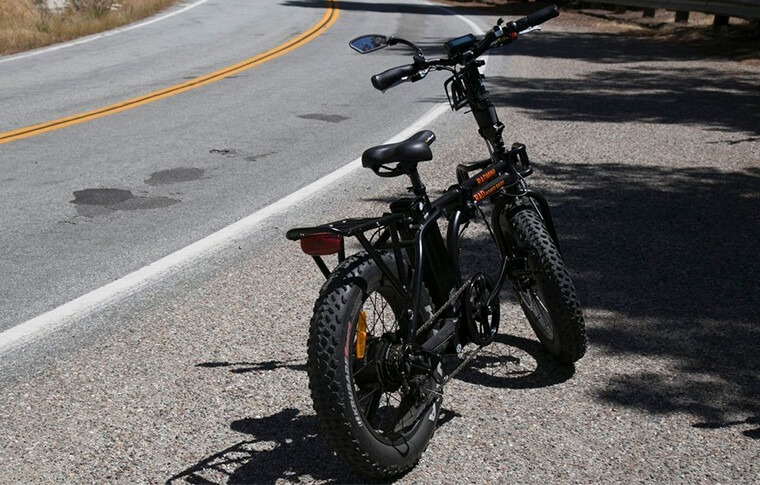 The fat tires also perform well on the sand or cruising on the road. Check out the full list of bikes in the previous tab. If you don’t want to pedal much and you’d like to ride more than 20 miles, consider renting an extra battery for $10. For those riding with children, we can add a tag-along bike or a child’s seat (for children up to 48.5 lb) at $5 per hour. You can also reserve one of our RadWagon cargo bikes: one with room for kids on the back or one with a toddler seat. We are currently limiting the maximum duration of overnight Step-Thru rentals in order to accommodate those wishing to test the Step-Thru. We have ordered more of these bikes, but they are on backorder. I had a great time. The two men who ran the shop were very friendly and helpful. I’d always scoffed at motorized bicycles, but it was actually a lot of fun (especially for someone who isn’t terribly athletic). I could do it, (we did over 20 miles) and it was just fun. I’d do it again for sure. 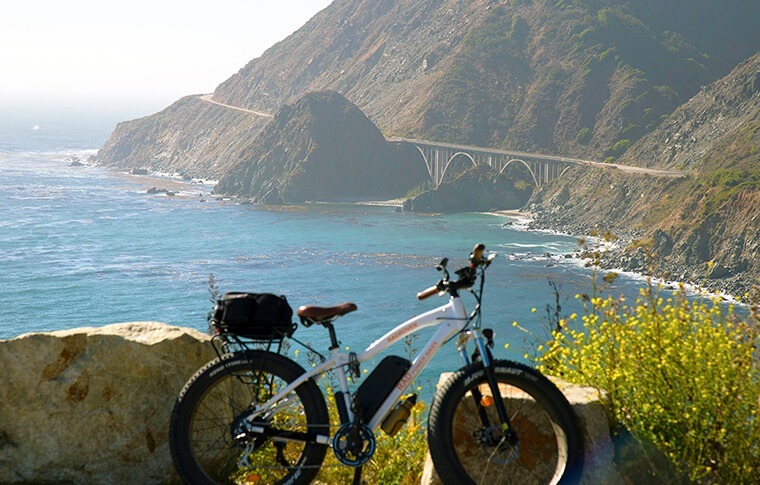 What a great way to see the central coastline of California! Our inter generational group (19 months to 55 years) rode from Cannery Row Monterey to the Lone Cypress at Pebble Beach. We packed lots of food and loaded the little one on cargo bikes for a day of fun. 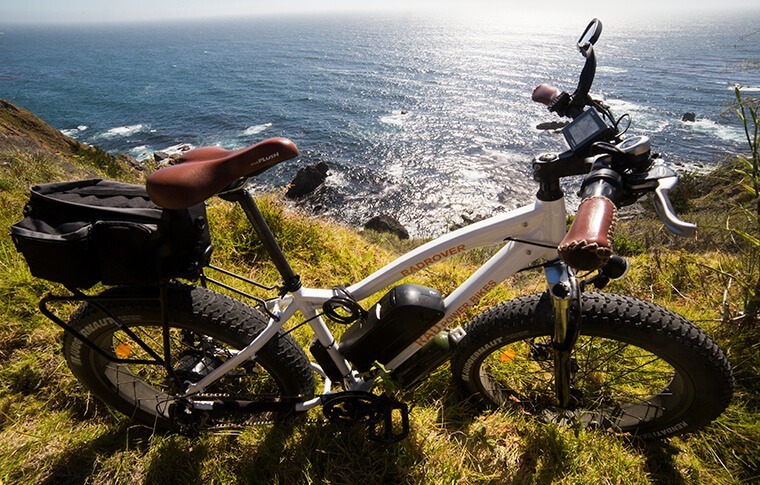 The electric bikes made it possible for all levels of fitness and experience to have a great day! 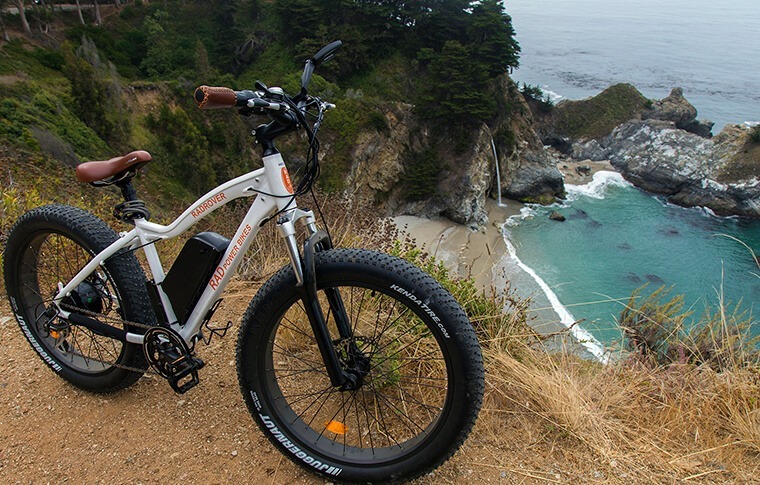 Had a great time seeing the Monterey coast on these electrical bikes. They made the ride so fun and effortless! Both my teenage kids and I enjoyed the experience. The bikes are easy to control and mount/dismount. The staff are super nice and helpful. Highly recommended! Very affordable prices for the experience you get. 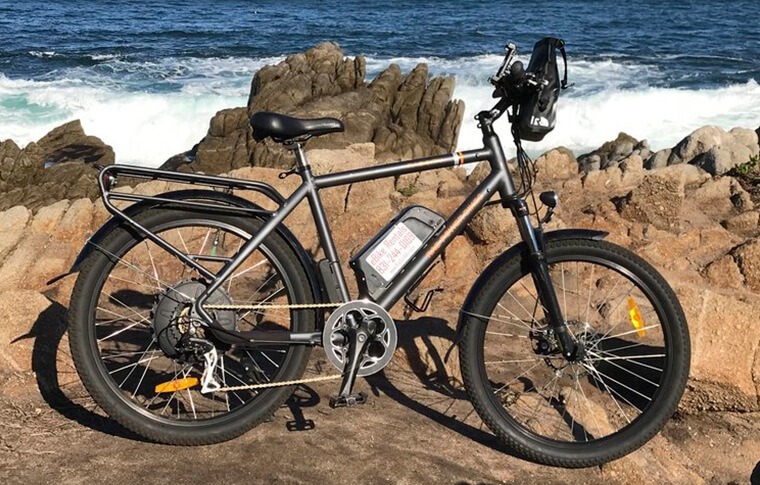 I rented an electric bike for two hours and rode south to seaside and back north to lovers point. The trip felt very personal as I got to avoid traffic, crowds, and reach beautiful spots faster than a car. The employees are very friendly and helpful. I had a HUGE grin coming back to the shop from the adrenaline and exhilaration of riding on the street. 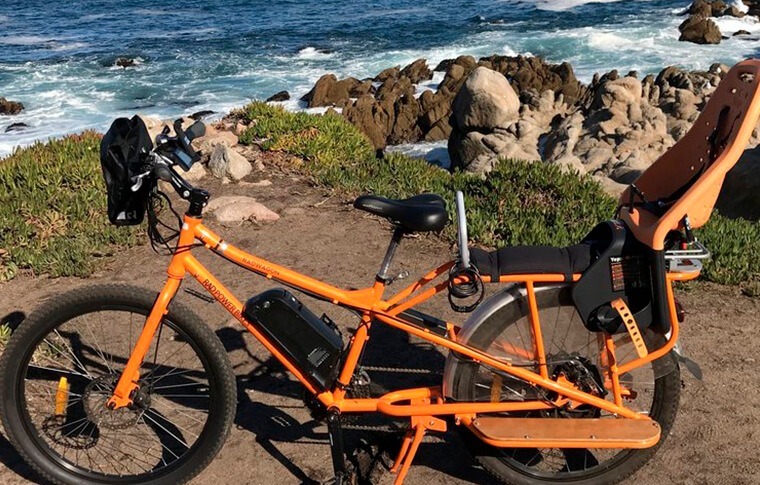 We rented two of their big tire electric bikes and went on an amazing bike ride around the coast down to Pebble Beach. The bikes handled great! They shifted gears correctly, didn’t have any annoying sounds or malfunctions. I chose this place over their competition because of the quality of their bikes and their prices. The two gentlemen that I worked with were professional and explained how the bikes worked before we left.